Nov. 26, 2018 — TURBO, Colombia (Nov. 22, 2018) – Since her sophomore year in high school, Michelle Tayas-Rivas has wanted to be a Hospital Corpsman. Tayas-Rivas travelled a long way to get where she is now. She originally came to the United States from Panama at the age of two. Tayas-Rivas brings a unique skillset to the hospital ship USNS Comfort’s (T-AH 20) mission. 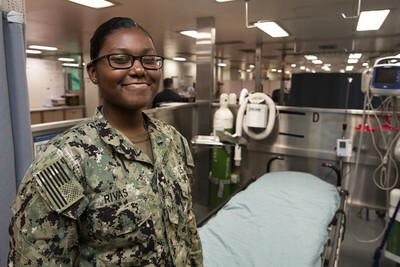 She is a corpsman who can directly translate patients’ needs to the healthcare providers at the medical sites and aboard the ship. Tayas-Rivas has helped in every host nation Comfort has visited during its mission to Central and South America.